Anything Goes at Nottingham Arts Theatre by Nottingham Uni Musicality company. – East Midlands Theatre. Anything Goes at Nottingham Arts Theatre by Nottingham Uni Musicality company. 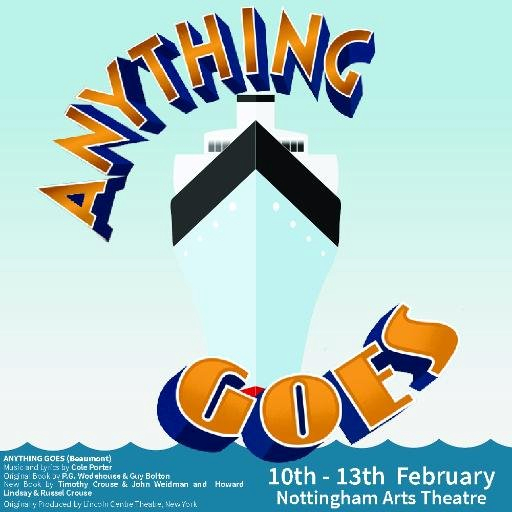 Nottingham University student based group Musicality always impress and East Midlands Theatre can hardly wait until they present their next big show ‘Anything Goes’ at Nottingham Arts Theatre. 10-13 Feb 2016. If you haven’t booked yet we suggest you ‘get on board quickly’ (we love puns) and book asap as you don’t want this particular ‘all dancing – all singing’ ship sailing off without you! To beat those Winter blues with a family friendly ‘ full of hot talent’ musical and Cole Porter cruise like no other book now! Online Booking Office is RIGHT HERE Starboard bow! A selection of terrific shows in January and February at Leicester Curve. Derby family set to meet King Arthur through Oddsocks Productions!